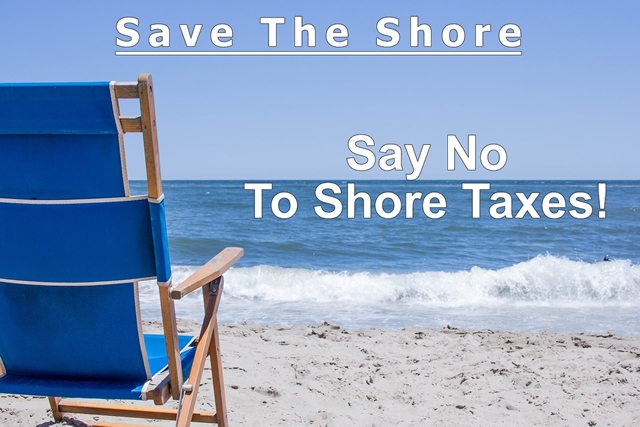 Help Us Fight The Shore Tax! Are you an owner? A renter? Do you have a local business at the shore? Then these taxes AFFECT YOU. Since these new taxes went public a few months ago, people have been asking “What can we do?”, “How can we help?”. To date, we have been asking for your phone calls and emails, and to your credit you have responded. Our legislators have logged thousands of calls and emails in support Bill A-4520 to repeal “the shore tax”. We still need those calls and emails to continue as we need to keep this legislation front and center. Calls and emails are only part of this fight. To that end, a group of concerned Vacation Home Owners have formed the “NJ Shore Rentals Coalition”, a registered Non-profit. While we are volunteering our time, we need financial assistance to pay for some professional services. We have retained the services of an Attorney and a Public Affairs counsel to help us navigate through the legislative process. So far they have been a tremendous asset in advancing our campaign and guiding us through each step along the way. In addition to retaining these professionals, we will incur other expenses that we need to be able to cover to keep this fight going. Unfortunately, guiding legislation through the NJ Senate and Assembly is not a quick & easy process, nor is it an inexpensive one. We have launched this campaign to raise money to fund these efforts over the next several months. Even getting these bills on a “fast track” would at BEST get them on the Governor’s desk at the end of December. As such, we need to make sure our campaign is funded through at least February so that we can keep constant attention on these bills until the day they are signed into law. Starting TODAY, we are launching a GoFundMe campaign to raise money to take this fight to Trenton. We are confident that we can get this tax repealed before it does any harm to the Jersey Shore economy, but we need your help to make sure. We are asking everyone to contribute to this cause and to help save the NJ Shore so that we can all enjoy it for years to come. Please visit our campaign page and donate today. Thank you for your time, your effort, and your support.